Alexander Ramsey served as both the first governor of the Minnesota Territory and the second governor of the state. Ramsey was born in 1815, the son of a blacksmith. 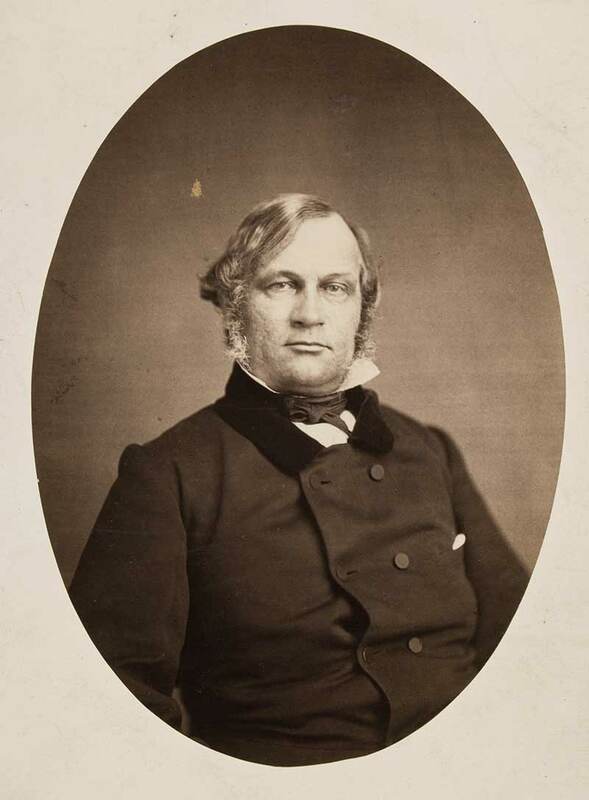 He rose within the political ranks of Pennsylvania before coming to Minnesota in 1849 with his wife, Anna, and the first of their three children. Two of their children died in childhood. Ramsey was appointed by President Zachary Taylor to the governorship of the newly formed territory in 1848. In that capacity, which he held concurrently with that of superintendent of Indian affairs, he negotiated treaties on behalf of the U.S. government with the Dakota for the cession of large areas of Minnesota land for white settlement, most notably the Treaty of Traverse des Sioux in 1851. Ramsey spent much of the 1850s overseeing the growth of the territory of Minnesota as white settlers poured into former Native American land that was rich in furs, lumber, and river trade. He lost his bid for first governor of the newly created state to his friend and political rival, Henry Sibley. In 1860, however, Ramsey was elected the state's second governor. In 1861, Ramsey was the first state governor to answer President Abraham Lincoln's call for troops at the outbreak of the Civil War. In 1862, after years of tension between the Dakota and the burgeoning white population of the state, war broke out when factions of Dakota attacked settlements, towns, and government outposts in central and southwestern Minnesota. Many of the factors that led to war were directly related to the treaties Ramsey had helped negotiate and the lack of compliance with them by the government and traders. Ramsey appointed Henry Sibley commander of the forces raised to fight against the Dakota, notoriously stating that “the Sioux Indians of Minnesota must be exterminated or driven forever beyond the borders of the state.” The subsequent six-week war resulted in the deaths of hundreds of civilians and soldiers and unknown numbers of Dakota. Thirty-eight Dakota men were hanged in Mankato on Dec. 26, 1862, while nearly 300 of those convicted by military tribunal were imprisoned at Camp McClellan, near Davenport, Iowa. More than 1,600 non-combatants were held in an internment camp at Fort Snelling over the winter of 1862-63, before being forcibly removed to reservations in Dakota Territory and Nebraska. Ramsey went on to be elected as a U.S. Senator and served as Secretary of War under President Rutherford B. Hayes. He spent subsequent years in business pursuits and made a sizeable fortune in real estate. In 1868, construction began on an opulent new home for the Ramsey family in St. Paul's fashionable Irvine Park neighborhood. In 1875 Marion Ramsey married Charles Furness in a lavish wedding in the parlor. In 1878, President Hayes and his wife visited St. Paul, including a stop at the state fair and dinner at the Ramsey House. Anna Ramsey died on Nov. 29, 1884, and Alexander Ramsey died at home in St. Paul on April 22, 1903. Their granddaughters, Anita and Laura Furness, never married and lived in the house until their own deaths in 1959 and 1964, respectively. They left the house and all its contents to the Minnesota Historical Society, founded in part by their grandfather in 1849.